If there's a day of the year that is the equivalent to the Super Bowl in the Disney community, then it would be Dapper Day-- at least that's what it feels like to me. 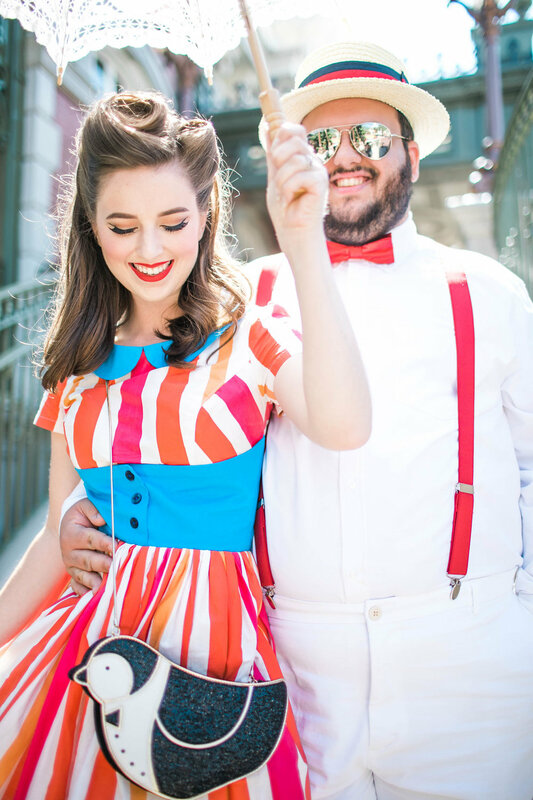 Dapper Day brings Disney, fashion, and vintage clothing lovers together and it most definitely is a day I look forward to! This was only my second Dapper Day ever and I started planning my outfit months in advance! Nothing gives me quite the thrill and joy as putting together the (practically) perfect outfit, so when I was gifted this quirky Kate Spade purse by my sister-in-law for Christmas, I knew right then and there I was going to use it for a Dapper Bert look! By the time I finally sat down to write this post, it's coming on the heels of the devastating news that Kate Spade has passed due to suicide. I thought this post would be a perfect way to honor her as one of her purses is what inspired this whole look and was quite literally the star accessory and what really put this look over the top. So many pieces from her brand have played such a special role in many of my most happy days and I am so glad that I have this day, these photos, and this purse to look back on and think of how Kate Spade was an inspiration to so many, myself included. Before I go any further, I want to take the time to say: If you, or anyone you know, is suffering from depression, anxiety, or any other mental illness, you are not alone, you are loved, and you are worthy of help and compassion. If you ever need a friend or someone to talk to, I am always here. I myself struggle with crippling anxiety and I would never want anyone to feel that there is no hope. I've been there, but I've also gotten through it. Please never hesitate to ask for help. I dedicate this post to Kate Spade for being such a ray of color and happiness to so many. She will be missed. Once I had the penguin purse, it was time to complete the outfit. This actually turned out to be the hardest part because I searched for weeks trying to find the perfect outfit pieces to make this outfit what I had envisioned in my mind. I was almost at the point of giving up and changing themes to a different character when I serendipitously stumbled upon this dress from Vintage Inspired by Jackie on my Instagram explore page! My jaw dropped and I immediately went into squealing fits of joy and relief! This dress, down to the Peter Pan collar and embroidered penguin on the skirt, was EVERYTHING I was looking for! I immediately reached out to Jackie and told her my overwhelming delight of finding her and this dress and she so kindly and generously gifted me the dress to wear to Dapper Day. I am so thankful she did that and I can honestly say that I recommend her for any kind of dress you may need in the future for fun bounds or Dapper Days! The quality is top notch and the service is impeccable! After that, I used pieces I already had including this parasol that once belonged to my friend Alex, some ruffle socks, and a pair of brogue, saddle shoes I had scored for $10 on sale at H&M a couple years prior! As I stated earlier, details like the Kate Spade purse are what truly make a look and when it came to my hair, that was no exception! I teamed up with my friend Mychael from Atelier Salon once again to bring my hair dreams to life and as always he did not disappoint!! He gave me the perfect style that fit with the theme and time period so well and what is even more impressive is that it stayed locked in place and looking flawless all. humid. day. long. If you're ever needing a stylist, makeup artist, or anything of that nature, Mychael is your guy! Love him so much!! Perhaps what was the most joyous part of this whole experience was having Dylan there with me all dapper as well! I loved that from the second I told him my idea back at Christmas that he was so eager to do this with me and dawn a dapper version of Mary Poppins. I always want to be a little unique and different so I thought what better way than to switch gender roles! I have seen so many incredible Mary and Bert looks in the past, but I hadn't seen any gender bends of them for Dapper Day! Dylan's entire look came from Amazon and I loved how crisp and classy he looked! Makes me want to get all gushy because it really was just so special to do this with him! We loved spending the day at Magic Kingdom with our friends and fellow Disney-lovers. It was such a day to remember and I will always beam with pride when I think back to how many people stopped to tell us how great we looked and "Wow! That purse is the perfect piece for that bound!" I got to share so much love and gush to people all day long about how great they looked and I think that's quite amazing. The entire day was full of people being kind, passing out compliments, and wishing everyone we saw (and who saw us) a happy Dapper Day! Sure, the outfits are fun to put together, but if anything, I think what the outfits do to bring people together is the best. I'm already planning my next Dapper Day outfit! Thanks so much for reading!